‘Over here Sir’, says the border control officer. ‘Yes, just there. And Madam, you here’. We shuffled next to the officer with our bikes. ‘OK now, 1, 2, 3, smile!’ I could not believe it, within 30 seconds of walking through the Wagah border gate that seperates India and Pakistan we have been asked for a selfie, before our passports were even checked! 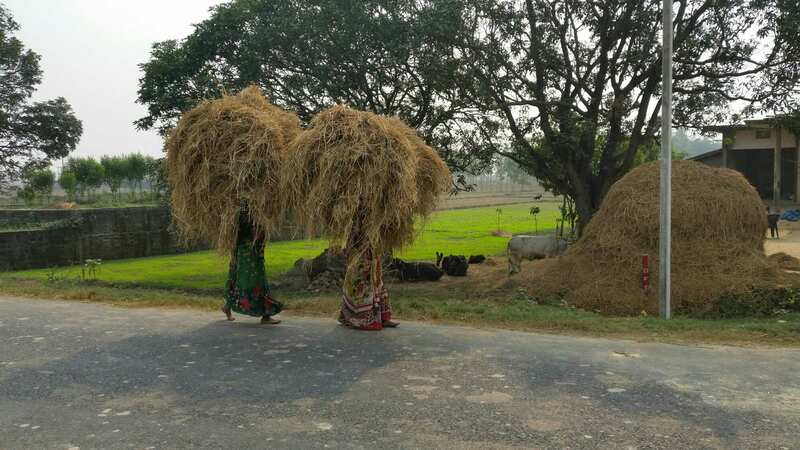 Welcome to India, a country of 1.3 billion people and all the pleasures and pain that come with it. 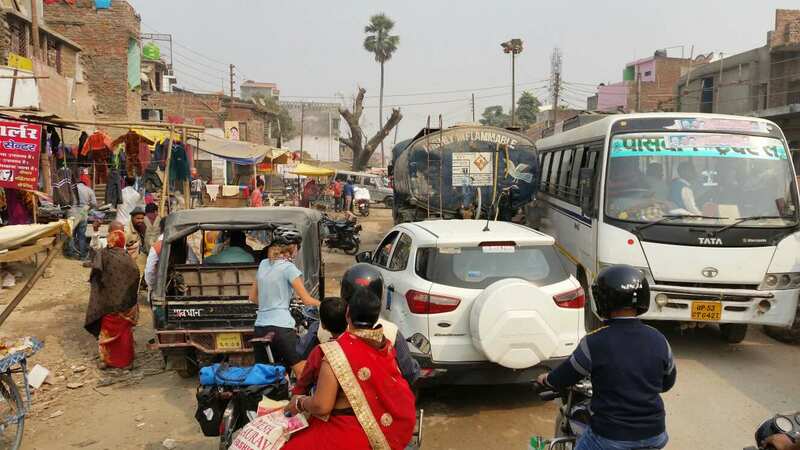 Of course there was pretty apalling traffic heading into Amritsar but the colours sites and smells of a new country took the pain away somewhat. In particular the brightly coloured turbans that Sikh men wear, from neon orange, purple, pink and blue, and the welcoming smiles we received on riding into the city. 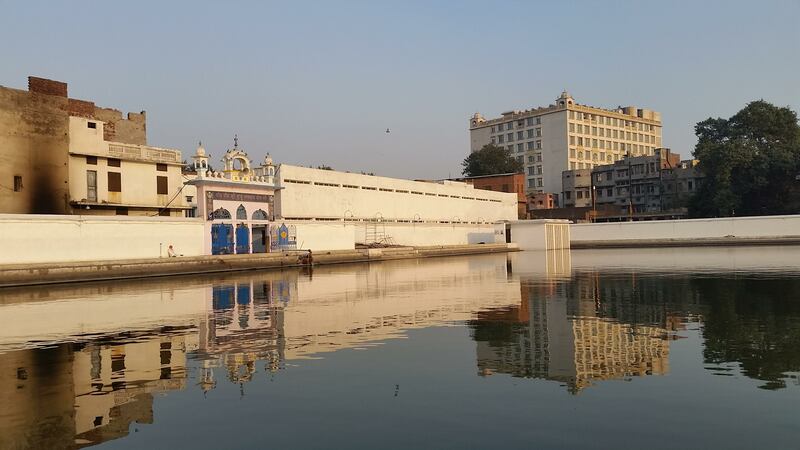 We were able to camp at Mrs Bhandaris Guesthouse, a haven away from the hustle and bustle of Amritsar but only a 2km walk into the centre of town. After setting up camp we went straight to the train station to try and buy a ticket for 2 or 3 days time to Gorakphur. We had tried to buy tickets online in Pakistan but were never able to make the final payment to secure a reservation. After waiting in a small queue, which grew gradually from the front as people butted in, I used my gender authority to push to the front. One plus of being a female in India is that you generally get given room when needed but you need to fight for it, elbows and all! 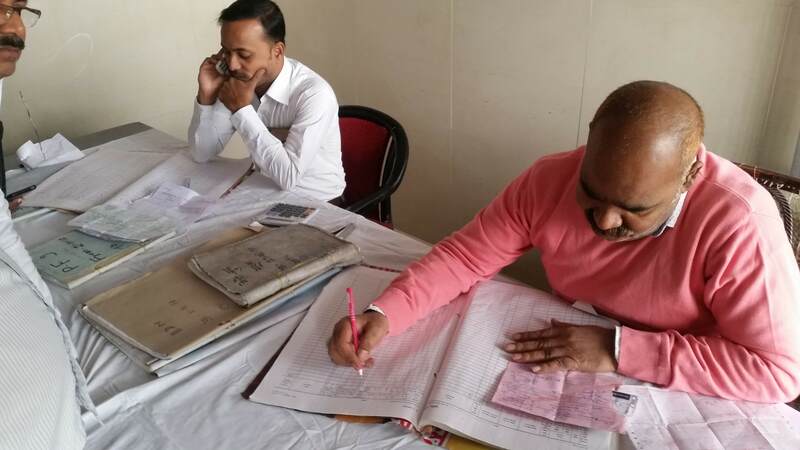 As suspected the ticket officer informed us all tickets were sold out and if we wanted to travel in the next few days we needed to apply for a ‘taktal’ ticket. Taktal tickets are a limited number of reserved seats that go on sale a few days before the train leaves. It’s first come first served and tickets often sell out within 30 seconds! We thought our chances of success either online with average Internet, or trying to get to the front of a frantic queue at the station was limited. So, with little time on our hands we visited a travel agent. Agents will do the dirty work for you, for a commission of course. It’s one we were willing to pay an extra £20 for, even if it was double the price of the actual ticket. 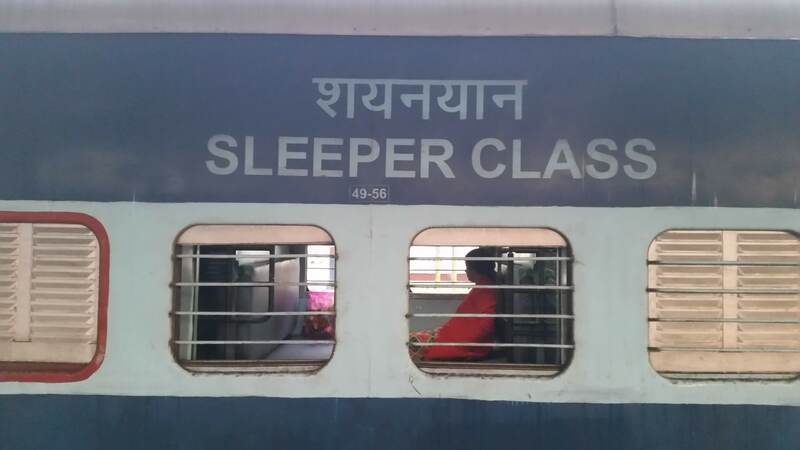 We chose Sleeper Class tickets - the cheapest reserved bed option. Our man was true to his word and after few phone calls that evening, we had tickets in our hand by 2pm the following day. Next challenge, getting the bikes on board, but first a day off to explore Amritsar. 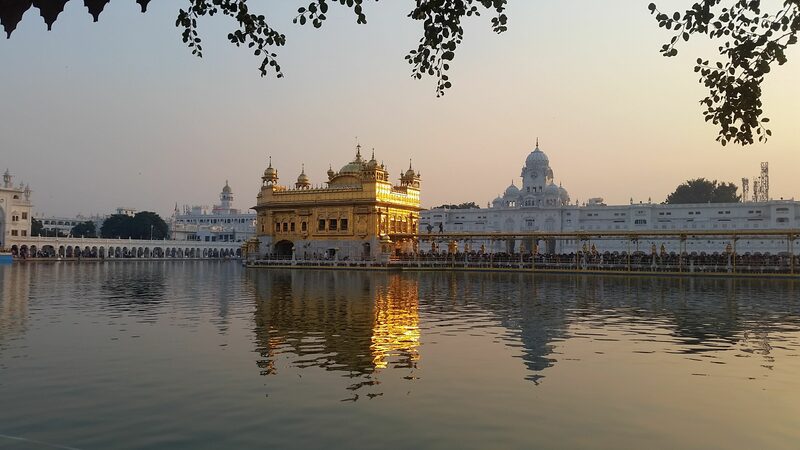 Amritsar is most famed for the ‘Golden Temple’, the holy shrine and place of pilgrimage for the Sikh religion. It is free to visit and is stunning, it should be on everyone’s top-10 places to visit in this region. Sikhism is one of the world’s youngest religions, originating in the Punjab region in the 15th century. One fundamental belief of the Sikh religion is equality of all human kind. To this end you will find the Sikh people some of the nicest, most caring and hospitable. 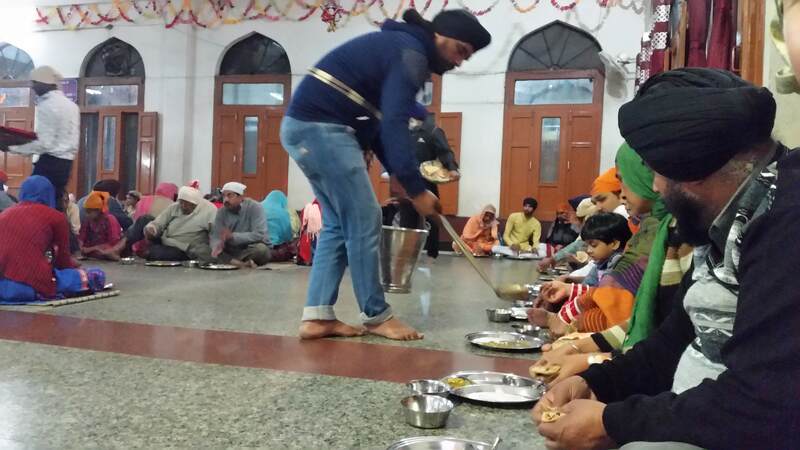 Sikh temples will often offer food to visitors and the Golden Temple is no exception. At the huge Langar Hall you can eat with thousands of others for free. The kitchen serves up to 100,000 people a day, and will keep scooping dahl onto your plate until you get up to leave! We ate well in Amritsar. 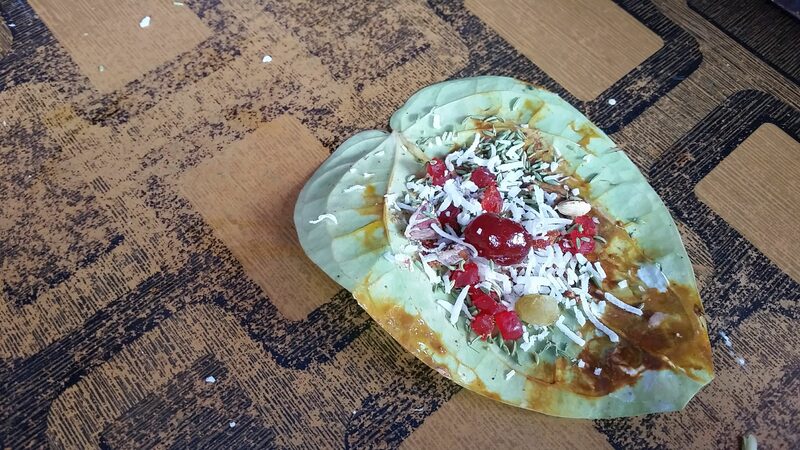 Whilst vegetarian food was never hard to find in Pakistan, it lacked variety. 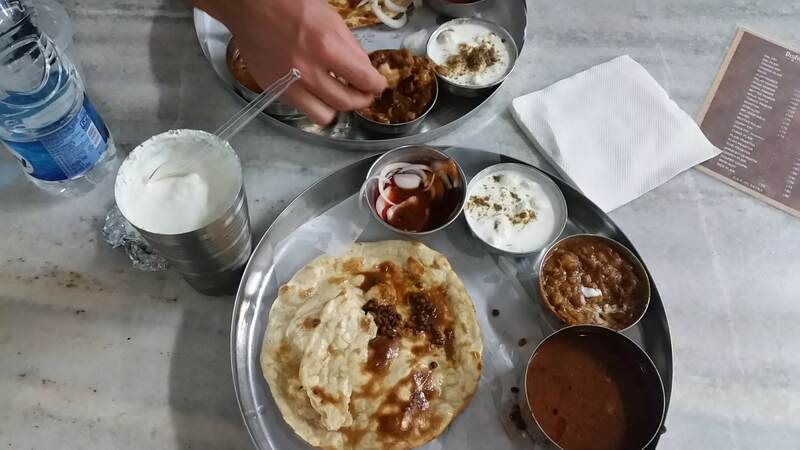 We are now in the land of thalis, my favourite being with paneer (Indian cheese), served tikka style or one of the many different curry sauces, with roti breads or rice, fresh raita and a buttery lassi to wash it all down. Absolute heaven and incredibly cheap. 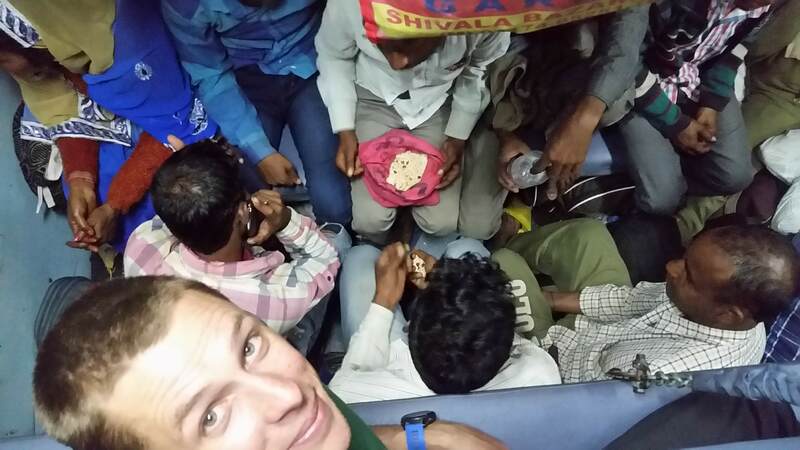 India has a system for everything from buying a train ticket (see below) to sending a letter. 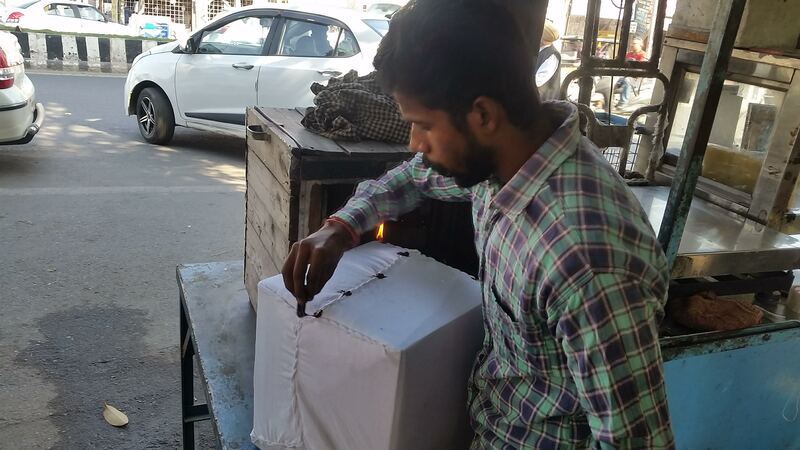 It may seem arduous and bureaucratic but most if the time it works…so we headed to the India Post office to see if we could loose a few kilograms and send our winter clothes onto New Zealand. Luckily we hadn’t spent hours carefully packaging everything up, because they do that for you, well you pay £2 for a guy on the street to do it for you. Hand-sewn and wax sealed, the entertainment value was worth £2 at least! We paid about £20 for 6kg via the slowest route and it reached NZ in just over a week! I was quite terrified of what a Sleeper Class carriages would entail, with visions of us having to climb over hundreds of people to get to our seats. But first, the bikes. As our train left at 6am we had to book, and pay for our bikes, the night before. This involved A LOT of form filling in and a small fee (500 rupees / £5) to book the bikes into the luggage cart. You cannot get your bike on a long distance train without booking it on first. The bikes then stayed in the luggage room overnight before being loaded up in the morning. We arrived at the station by 5:15am to make sure our bike got loaded on. Luckily for us Amritsar was the starting point for our train and we only had 1 other person sitting in our 6-seater section. 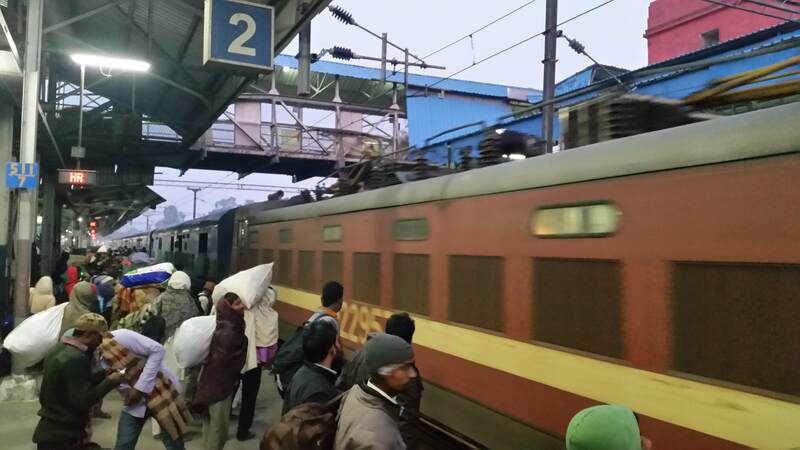 The sleeper class arrangement has open booths with 6 bunk beds, of which the bottom bunks are used for sitting on during the day, and the coridoors is lined with two bunk beds(upper and lower). We chatted with our travel companion over one of the many train chais (shot-sized cups of sweet Indian tea) that we would end up drinking. Our new friend proved invaluable when a few stops later a group of 4 got on, each with 2 sacks (of who knows what) each, that they tried to squeeze under our seats. These four were with us for the next 27 hours, whilst our friend got off at the next stop after only 1 hour. At 6 people we were cosy, until after a few more stops we grew to 8 and by nightfall there were fifteen squeezed into a space for six! We did as promised get our beds at 8pm after the guy who had reserved the bottom bunk kicked everybody out! Challenge 3 - Find the bikes!!!!! Getting off the train was a damn sight harder than getting on. I ended up climbing over the masses and standing on the platform whilst Jules passed me the bags through the open window in the booth next to us. He then sprinted down the platform to get the bikes from the luggage cart at the end of the train. After waiting by myself for over 20 minutes, long after the train had left, I started to get a bit worried. Eventually Jules came back empty-handed - crap! The luggage cart had been closed when he got down there and the manager insisted that the bicycles had already been taken off. At the luggage office we had to persistently ask the managers to make phone calls to find our bikes! Finally, and as expected by now, we were told the they hadn’t been taken off the train after all and that they would be brought back on another train by that evening. After yet more form filling and paying 100 rupees for the privilege of picking up our bikes the next morning, we were reunited and ready to leave India!!!! Gorakphur is a modestly sized town of 700,000 but getting out was horribly busy and polluted, even on the b-road. 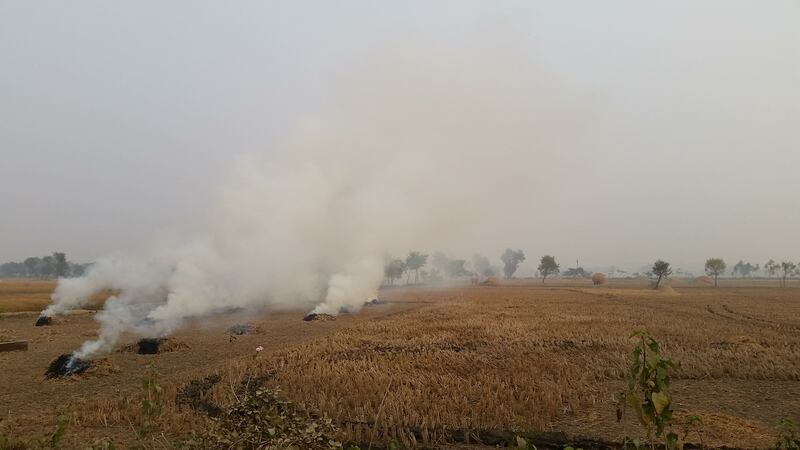 The countryside wasn’t much better with crazy thick smoke from all the farmers burning off their sugar and wheat crops with obviously no legislation on when they are allowed to do so. It was bearable for one day though and a welcome change from city cycling. I was surprised by the number of mosques we passed in the countryside. Brightly coloured spires stood out in the countryside and reminded us that whilst Hinduism may be the dominant religion in India, it still contains the third largest population of Muslims by country (behind Indonesia and Pakistan). Despite partition and all the chaos it caused / still causes today, it has been heartening to see people of all religons living peacefully side by side. By the end of the day the constant beeping from motorbikes and selfie requests had driven us both mad and we headed for the nearest guesthouse marked in Google, with camping being impossible in this busy area. Google took us down a farm track to a small collection of houses - ‘hotel?’ ‘camp?’ we tried, gesturing that we needed somewhere to sleep to a group of men outside one of the houses. ‘Yes yes, no problem’ they replied ushering us to sit. Instantly our guard went up. Everything is no problem if you ask an Indian, but is it?! After a cup of tea and some biscuits we were no closer to having anywhere to sleep and it was now dark. Several of the men had been making a few phone calls and finally one said he could take us to a hotel. By this point we were almost too tired to care, but it was without doubt the worst ‘hotel’ we have stayed in all tour. We pitched our tent inside our room and sprayed ourselves head to toe in deet before venturing into the bathroom. 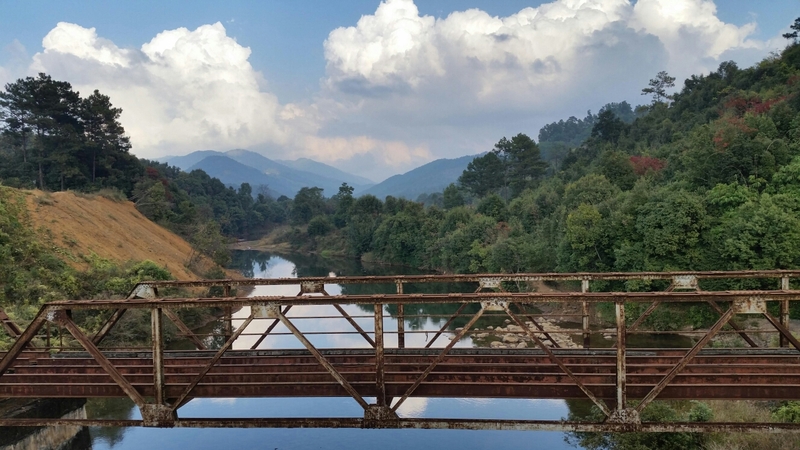 The only saving grace was the owner making us a veg curry from scratch, although it was so spicy and my stomach wasn’t feeling great so with that we went to bed and looked forward to the short ride to the Nepalese border the following day. Always something to look at whilst cycling here, for us at least!